There are many different types of dental crowns available, including metal, resin, ceramic, and porcelain fused to metal. Dental crowns can be built in a lab, taking a week or two to complete, or they can be created same-day using sophisticated CEREC technology. Each of these types of dental crowns has its own benefits and drawbacks, and after years of practicing dentistry and keeping up with the latest in technologic advances, our Boston dentist Dr. Ryan Clancy has opted to use only same-day CEREC porcelain dental crowns. If you are in need of restorative or cosmetic dentistry, please call Dr. Clancy at 781-350-4385 to schedule your complimentary consultation. Dr. Clancy will assess your teeth and gums and determine the best treatment plan to get you a healthy, beautiful smile. Metal: Metal crowns are the most durable, but they are also the least natural and most obvious in the mouth. Plus, metal has a tendency to expand and contract with differing temperatures, which could lead to the crown falling off. Resin: Resin looks more natural than metal, but it is the least durable material. 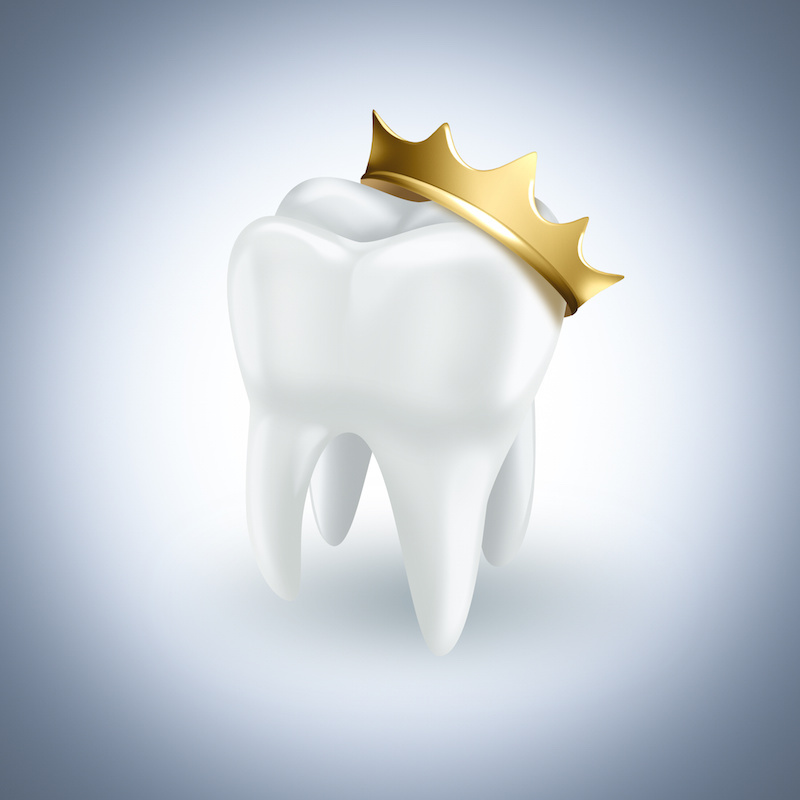 If your dental crown is made of resin, you will likely need to have it replaced or fixed multiple times. Porcelain fused to metal: The primary benefit of this type of dental crown is that it looks natural while still having a strong metal base. However, a major drawback is that often patients end up with a visible dark line at the gums where the metal shows through. The porcelain can also chip, revealing the metal underneath. Porcelain: Dental porcelain is Dr. Clancy’s first choice of material. It looks natural, and is strong and durable. It is not quite as strong as metal, but the majority of patients find that their porcelain crowns last a long time and are much more visually appealing than metal crowns. Why Choose CEREC Same-Day Porcelain Crowns? In the past, dental crowns were always made out of metal. While metal restorations are very strong, they are also very obvious and unnatural in the mouth. Porcelain dental crowns can be customized to match your existing teeth, and they are made of a translucent dental-grade porcelain that mimics the look of real dental enamel. Our patients love the convenience of being able to have their permanent crown placed in one appointment. The typical process for placing a dental crown involves multiple visits spread out over a number of weeks, during which you have to wear a potentially uncomfortable temporary crown. CEREC same-day crowns eliminate the need for a temporary crown, and allow patients to walk out of the dentist’s office with their permanent dental crown in place. While CEREC crowns cannot be customized to the same extent that lab-made crowns can, the difference is negligible. We are able to create custom dental crowns that fit seamlessly into your smile and match your existing teeth. If you think that you may need a dental crown, please don’t hesitate to contact Dr. Clancy at 781-350-4385 to schedule your complimentary consultation. We serve patients in Boston, Medford, Malden, Cambridge, and Somerville areas of Massachusetts. How Do I Stop Grinding My Teeth at Night? Can Exercise Contribute to TMJ Disorder? Can You Smoke with Invisalign? What Is the Difference Between Porcelain Veneers and Lumineers? Quiz - Do I Need Porcelain Veneers? Bonding vs. Veneers: Which Is Right For You? QUIZ: Is Your Body Warning You About TMJ Disorder? Quiz: Do you Fear the Dentist? Video - How do You Treat TMJ? Video - Do Porcelain Veneers Fade or Stain? What TMJ Technology Can Help Cure Your Headaches? Pumpkin Everything is On the Way. How to Keep Your Teeth White? Why Do I Always Have Headaches? Bad Breath? How to Get Rid of It Now! Looking for a Cosmetic Dentist in Winchester, MA? Oh, Where Teeth Whitening Will Take You! Traditional Porcelain Veneers vs. Lumineers : What’s the Difference? How Durable Are Dental Crowns?